Do you remember Potluck #1? Of course you do, it was super exciting, and all about holidays. I am pleased to announce that I am hosting Potluck #2: Comfort Food. Submissions can cover anything you like, and you do not have to stick to the theme! but please remember that we are trying to talk about intersections. Potluck is, after all, intended to be a carnival for multicultural and intersectional discussions of food, including but not limited to food discussions intersecting with disability, gender, sexuality, fat, animal rights, and cultural and racial issues. How many times have you gone to eat your comfort food, only to be told it's gross and weird and disgusting? How many times has advertising told you that your comfort food is wrong and terrible? Submissions are open until May 15th, giving you a comfortable six weeks to get something in. You can leave submissions in this post (please note that comments are moderated but will eventually appear!). Please feel free to submit links to your own posts or to someone else's. You may submit multiple links. Links will be included at the discretion of the host. Also we are looking for the next host, so if you are interested feel free to get in contact. So after some short drinks and aborted dinners, SJ and I finally met up for dinner. 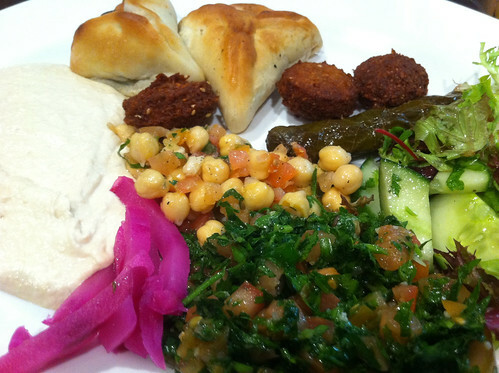 I suggested Tiba's, on the grounds that I was the only vegan in Brunswick who had never been there. We both went the vegetarian set plate, but mine was strictly no dairy. I was surprised that this meant I didn't get any babaganoush - I have eaten their babaganoush recently, so I'm super disappointed to learn it's not actually vegan! In terms of the plate I actually received, it was great. Way too much food for me, a bargain at $14! The hummous was super delicious, I loved the spinach pies (greasy as expected, but tiny so it was okay! ), and the salads were great. I don't know how universal an experience this is, but when I was a kid I used to love going to Pizza Hut where they had all you can eat, and when it came time for dessert I would always get a square of chocolate cake, and I'd cover it in soft serve ice cream and marshmallows. 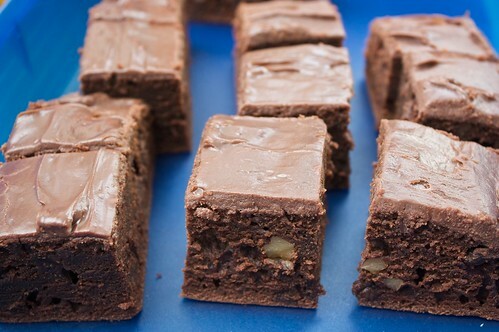 This brownie tastes like that cake, and I'm okay with that. Combine flour, cocoa, sugar, salt and baking powder. When it's all nicely mixed and the cocoa isn't clumping, gradually add in the milk, oil and lemon juice. Mix it all until it's smooth, then add in the walnuts and choc chips. Pour in to a lined baking tin (I used 20cm x 20cm and it was perfect), and bake at 180C for about 25 or 30 minutes. Let the brownies cool for a few minutes in the tray, then on a cooling rack. When it's getting pretty cool, heat a quarter cup of milk in the microwave in five or ten second bursts until it's warm, then pour in about a quarter cup of choc chips. If it's not chocolatey enough for you, add some more, and keep mixing until they're all melted. Set aside to cool for ten minutes, then pour/spread over brownie slab. Cut and eat. 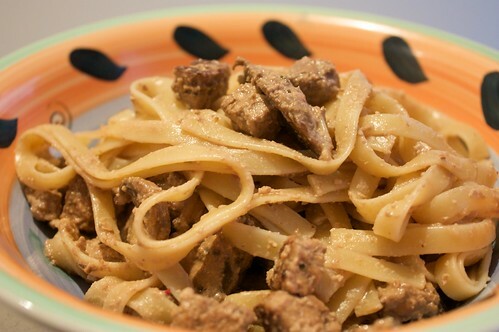 I was skeptical, at first, but it turns out a creamy pasta made from walnuts and featuring soy sauce is actually really delicious! I saw this originally at Seitan is my Motor and have modified it a bit, but I suspect the original deliciousness is still there! This wasn't too complicated, though it did make quite a few dishes. Dice the tempeh small, then soak in the soy sauce for about half an hour. If it soaks up all the soy sauce, add a little bit more. Make sure it's light soy! If you use dark soy then there will be tears. Sometime during this half an hour, set the pasta on to boil. When the pasta is done, drain, but reserve a smidge of the water. In a blender, blend the walnuts with the milk, the garlic and the chilli. Slice the mushrooms. In a pan, saute the tempeh (with any leftover soy sauce in which it was soaking) in a little oil or nuttelex, until it starts crisping, then add the mushrooms. Saute these until they are almost cooked through, then throw in the walnut mixture, plus the paprika, thyme and marjoram. Simmer for five minutes or so, until it has started to thicken (...more) and then throw in the reserved pasta water. Let it all simmer through, then combine with the pasta and a swish of lemon juice, and serve piping hot. The soy sauce combined with the tempeh and the walnuts to be amazing, and the addition of the chilli was perfect! If you want to reheat it, toss through a little lemon juice. Two weeks ago when I was in Perth I went out for lunch to The Royal, and Chris and Nick ordered the Oreo chocolate cake (...for dessert, not for their mains), and it was a solid chocolate cake with some sort of cream filling and a chocolate ganache, with an Oreo perched on top. Neither of them managed to finish these monstrosities, and I started pondering vegan takes on this. 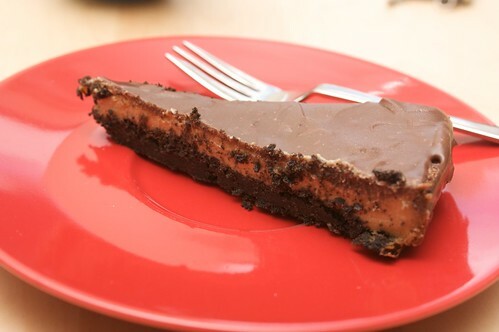 And then earlier this week Lisa tweeted a picture of a vegan Oreo cheesecake, and I started thinking about that. So I've had Oreos on the mind recently (I started dropping hints at Cupcake Central, and there's talk that they'll make a vegan cookies and cream). So I decided to give something a go, and here's what happened. All the recipes, vegan and non-vegan, suggested using one pack of Oreos for the base. This was a giant lie, and also had me fretting around the internet about what I should do with the filling (most common solution: eat it; surprisingly not the solution with which I went). I managed to crack my favourite mixing bowl (never mind that it's at least five years old, plastic, and cost five bucks from Crazy Clarks). I spilt sugar all over the kitchen. I finally wrestled the cake in to the oven, and then when I pulled it out I was convinced I had burnt it. But after all that effort, I decided to glaze the thing, and if it failed then it failed. Here's the surprising thing: it was delicious. I've been eating it all week. It's very rich, and I would make some modifications to it, but it worked, and mostly I'm happy with it. to make the base, grind up one and a half packs of biscuits. I used chocolate oreos, and added the filling to the mixture (but when I used plain Oreos, I harvested the filling and only used the biscuits). Melt the margarine and pour in to the mashed up biscuits, along with the quarter cup of sugar. Mix until combined, then press in to a lined spring form or cheesecake pan. Preheat the oven! Somewhere up about 280C. To make the filling, beat together cream cheese, sugar, flour, lemon juice, egg replacer and vanilla essence. Also add any left over Oreo filling you might have harvested from the Oreo bases. 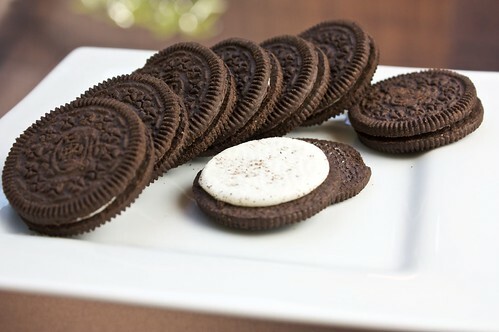 You may also want to crush up some more Oreos and add them to the filling if it takes your fancy. When it's smooth, pour it in to the base. Drop it a little if you have too many lumps. Just a note - if you do add the Oreo fillings to this, it will be lumpy. Don't worry, it will seep into the mixture with no problems. Shove it in the oven for 9 minutes, then reduce the temperature to about 90C and leave to bake for another 30 - 35 minutes. It'll be a bit brown on top, but don't let it burn. For the ganache: pull it out and set it aside to cool. Some fridge time is preferable. When it's nicely set (at least an hour in the fridge), bring the soy milk to the boil, then remove from the heat and add the choc chips and the golden syrup. Stir this until the chocolate melts. Let it cool for ten minutes, then spread it around the cake. Let it all cool, then it is ready to go. It's pretty rich, so maybe don't be too generous with the first cut.